Discount Aladdin tickets are trending at the top of national theatre queues after 32 shows in NYC went on sale yesterday, said Marta Ault at online discount ticket marketplace BuyAnySeat.com. The stage version of Disney’s 1992 animated classic began its Broadway previews last February and after playing to over 100 percent capacity again last week, the musical is now booked for regular performances through January 4, 2015. The stage version of Disney’s 1992 animated classic is playing at the New Amsterdam on Broadway through January 4, 2015. Seen here, Adam Jacobs as Aladdin. It’s been 22 years since Aladdin arrived in theatres. Now, the stage version of Disney’s 1992 animated film classic has finally appeared on Broadway, much to the delight of patrons along the Big Apple’s storied stage-filled strip. After a preview run began last February at the New Amsterdam Theatre, tickets were released yesterday to 32 more shows, with 218 full dress performances now on the books through January 4 of next year. Adapted for the stage by writer Chad Beguelin and eight-time Oscar-winning composer Alan Menken, the play features hit songs from the film, plus several more written for Broadway. The production, directed by Tony-winner Casey Nicholaw, features Adam Jacobs and Courtney Reed as Aladdin and Jasmine, Jonathan Freeman as Jafar (reprising his part from the movie), and recent Tony Award winner James Monroe Iglehart taking on the role of the Genie, a tough gig given actor Robin Williams' memorable movie moxie. “Like the film, the play is generating rave reviews in its own right. Not only was it nominated for a remarkable five Tony Awards including Best Musical and Best Original Score,” said Marta Ault at online discount ticket marketplace BuyAnySeat.com, “James Monroe Iglehart, who stars as the genie, also won the 2014 Tony Award for Best Performance by an Actor. "That’s why we’re proud to be able to offer theatre-goers the most comprehensive and continuously updated selection of discount theatre tickets online, with a Worry-Free Guarantee to protect their purchase,” added Ault. The story, created from centuries-old folk-tales including "One Thousand and One Nights”, was a massive box office success and sold a record-breaking 25 million VHS recordings. In the musical, Aladdin, played by Adam Jacobs, is a charismatic street rascal in Agrabah, who stumbles upon an ancient lamp that proves to be much more than meets the eye. Unwittingly, he frees the lamp's rib-tickling Genie, played by James Monroe Iglehart, who grants him three wishes. Transformed from vagrant to prince, Aladdin catches the eye of the beautiful Princess Jasmine, played by Courtney Reed, who is longing for an adventure. Unfortunately, the wicked royal vizier Jafar and his minions are plotting to use the lamp for evil and it is up to Aladdin to keep Agrabah out of his grasp. The original soundtrack for the film won an Academy Award and Golden Globe for Best Original Score for composer Alan Menken and lyricists Howard Ashman and Tim Rice. Menken also wrote songs for "The Little Mermaid”, "Beauty and the Beast" and "Newsies”. The film’s music also tallied a BAFTA Award nomination, while the song "A Whole New World" earned an Academy Award for Best Original Song, a Golden Globe Award for Best Original Song and the Grammy Award for Song of the Year with lyricist Tim Rice. In addition, the movie album is one of the best-selling animated film soundtracks of all time, with nearly two and a half million copies sold in the U.S. alone as of April 2014. New York City’s New Amsterdam Theatre will host shows five nights a week throughout Aladdin’s run on Broadway, including Wednesday, Saturday and Sunday matinee shows, along with evening shows on Tuesday, Wednesday, Thursday, Saturday and Sunday. 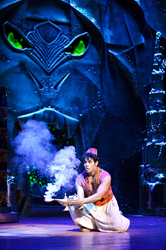 To shop for discount Aladdin tickets, visit BuyAnySeat.com. To save to even more, enter coupon code "BAS2014" during checkout.